A piece of software that aides in spinning content and publishing it on your website with other media and affiliate links. *Content spinning takes an original article and rewrites it using synonyms and rewording sentences. Spinning content from other people is plagiarism. Spinning your own content is a waste of time in my opinion. 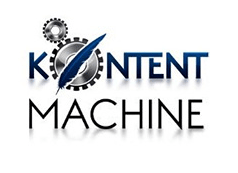 Even though there are some case studies that using tools like Kontent Machine can rank a site and earn money, it’s not as easy as spinning content and being done with it. There are numerous other grey hat and black hat tools that you will need to purchase in order to actually get decent traffic and make money. So my question to you is: Why waste time and money trying to trick Google into thinking you are a legit site when you use the same time and money to build a website that not only complies with Google’s policies, but also genuinely helps people? I’m surprised to see that there is still such a buzz around content spinning tools despite all the recent algorithm updates and penalties issued to sites that use copied (without a source) , low quality, or thin content. But people continue to look for “the easy way”, and there will and internet gurus are more than happy to comply with requests for Done-For-You blog posts, autoblogging software, and instant site creation. I was quite sure that I’d find a few posts saying that Kontent Machine 3 is no longer useful, but I found exactly the opposite. But not only am I doubtful of the long term viability of such a tool, the concept behind it also goes again my own ideas of how to run a successful online business. There is a forum for Kontent Machine 3, and it seems to be *somewhat* active. It’s certainly not a thriving community, but Georgiev hangs around and there a few recent threads with some active members when I was browsing. And as much as I don’t like to admit it, it seems that some people are actually able to make money using Kontent Machine’s spinning software and submission tools. I’m certainly not saying that it’s as easy as Georgiev makes it sound, and I’m not saying it’s a great business plan (more on that below). But after reading Matthew Woodwards Review and a case study about ranking a spam website it’s clear that some people are seeing results with this. This is the #1 gripe I have with so many internet marketers and product launches. Nobody can seem to be honest in their advertising and tell us what we can expect to get. Everything has to be exaggerated and twisted so that it sounds like we are going to be rolling in money in the next couple days. I think this tactic is a little played, and I might have given this product a better score if they would have just been honest about what they are selling. As much as people seem to ignore this fact, when you take someone else’s content and rewrite it as your own it’s plagiarism. Did you hear about the whole Shia Le Bouf controversy? He took one directors story and made an entire short film that was nothing like the original except in the main concepts. He was accused of plagiarism, and there was a whole tadoo about it. The same is true when you scrape the internet for other articles and use a spinner to rewrite them. I don’t think there’s really any risk of getting caught, let alone having any action taken on your site, but don’t fool yourself in to thinking that this is a legit way to publish content on your site. The same goes if you steal stuff from other languages and translate it into your own, like with Autoblog Samurai. Spun content is just plain low quality, and it doesn’t convert to sales. Sure, maybe you can get a few one-off sales from lost internet travelers that end up on your site listed on page 2 or 3 of Google. But if you were hoping for a cookie cutter, rewritten, gibberish website to be your bread and butter? You’re dreaming. Whatever case studies are being done about how well X, Y, or Z software does, the people producing those case studies don’t use that junk on their main website. Woodward may do experiments on junky sites to prove that he can manipulate the algorithm, but he certainly doesn’t use it on his own blog. The same thing happened when private blog networks were taken down last month. All those niche website guys recommended to their readers for quite some time how “safe” PBNs were and how they produced great results. Lo and behold, after Google deindexes all these link networks their main money sites are doing just fine because they didn’t use the junk they recommended on their top earners. Not to go off on case studies here, but many times they are just indications of what happened ONE time, for SHORT period of time, rather than what’s the norm. That’s not true all the time of course, but you need to take some of the fantastical headlines with a grain of salt. if you think the stuff produced by Kontent Machine is “Google proof”, you're dreaming. Total cost of operation one of the two main issues I have with Kontent Machine 3. The thing you need to understand is that costs don't stop with this piece of software. Now you need to get a link building plan and figure how how you are going to manage your various link tiers. You’ll need a content spinner, a content submitter. You could probably use some PLR content, a keyword research tool, link cloaking software, an autoblogging tool, upgraded hosting (possibly separate hosting accounts), and a proxy service. Now your monthly costs are well into the $100’s of dollars, and you have to spend hours upon hours learning how to use all this stuff effectively. The worst part is that the end result is a black hat website that is guaranteed to tank with one of the impending Google algorithm updates. If you are going to be spending all that time and money building a website, why not just make it a good one? Why not hire some legit writers and spend time doing your own research? Why not spend time reaching out to people in your niche and being part of the community? Buy a premium WordPress theme, hire someone to make a nice logo for you, and build a brand that actually helps people instead of focuses on trying to manipulate the search algorithms. I know that at this point some of you will chime in and say “White hat sites get hit too. It’s not worth trying.”. True, some people that genuinely try to play within the rules get penalized. But they are the exception to the rule. I just don’t see the point of spending time any money trying to break the rules because you feel the need to stick it to Google. I don't do ANY link building any more. OK, I did write 1 or 2 articles for an article directory a few years ago for this site, and I have done a few guest posts (on relevant blogs). But other than that, nothing. I do fine with traffic and sales. There's really no reason to actively seek links in a “link building” sense. There are legit ways to get links, ie participating in communities related to your niche and getting attention to your site. Creating content that people actually want to link to is the same deal. But building networks of websites with crappy content so that you can get thousands of low quality links to your site is a waste of time and money. ONE good link for a legit source is worth more than 10,000 low quality links. You can write one awesome article for your website and share it across social media, or you can spin hundreds of copies of a PLR article you bought, host them on various domains and attempt to create an indecipherable link wheel so that you can trick Google into thinking your site is worth something. Which one sounds easier? Which one sounds more effective? That's pretty much what I think about using this software to just for linking purposes. I kind of understand some of the analytical minds out there that want to test the limits. I imagine it to be kind of like legit hackers – people who just enjoy finding out what the limits of search engine algorithms. It can be fun to find a loophole, or find a system that works for you, especially if you feel like you’re getting away with something naughty. I get it. It’s just not for me. But I have to roll my eyes at the enthusiasm and fervor in the comment section of some of these “how to rank spam” posts, or case studies that show how Person A was able to rank on page 1 for whatever term using his super secret SEO method. People are hungry for that. Website owners feel like they have no control over the search engines, and therefore no control over their businesses. I know how humbling it feels to “beg” Google for rankings. But Google owes us nothing. I believe that they are doing their best to return the best results possible, fight spam, and get SEARCHERS what they need. Sometimes Google fails, but most of the time they are correct. What they are looking for is quality content that people want to read, share, and participate in. When you build your business around helping people, you are heading in the right direction and are well on your way to having a successful online business. When you purchase products like Kontent Machine 3 and spend your days trying to figure out how to temporarily squeeze a low quality website into Page 1 rankings by using deceptive linking manipulative marketing tactics, you are doing yourself, your business, and your customers a disservice. Sure, it works for some people, but that’s not the point. The whole strategy behind Kontent Machine is not for someone looking to build a long term online business. Can you rank a site and make money from a single website with no linking, no content spinning, and no autoblogging software? How about a single hosting account, a free WordPress theme, no paid plugins, or any other paid tools? Yup. I’ve done it. Simplify your business plan and focus on helping people. These are the principles taught at Wealthy Affiliate. It’s where I learned to build my first online business, and it’s where I recommend anyone wanting to build a legitimate, long term business they can be proud of get started. I’m looking for information on this kind of product, because I’m interested in a solution. Particularly for Local SEO, and Ecommerce common data. When we have to make a page for Dallas Plumbing Services, and then fifty other pages, for nearby cities, sophisticated spinning tools become a necessity. You can cut the cost down by an average of 66%, but using a unique seed article. That still means that 33% of the content has to be authored unique, and that’s still quite expensive. The same is true from an ecommerce angle, in many different situations. Most of the content needs out there are just from a factual standpoint. It’s not about being some kind of content Picasso, so this attitude, about spinning being plagiarism, just isn’t accurate. There are Billions of sentences, and raw information, out there, that don’t have any creative substance. If you wanna do an article, for example, about the Gestation Period of Mice, there are only so many things you can say, a certain way. I feel like this is similar to trying to patent air, or something similarly common, and freely available to everyone. Plagiarism is about stealing unique ideas, creative constructs, whatever you wanna call them, and saying that you were the original author. In Biblical copyright law, each Bible has to be 10% different, via substantially variant terms, in order to be legally copyrighted. The rest is essentially spun content, but it’s different enough to be considered a completely different work, worthy of a totally new copyright. As a point of concern, for me, I can tell you that even though the shell of the original meaning has traces in every translation, they DO NOT mean the same things. We do the exact same thing when it comes to the factual information we exchange, and after a few generations, it’s totally spent. That’s why, every year, some major firm, like Kissmetrics or SEMrush, come out with some new study, using their insight into mass analytics, talking about how bigger and bigger content is ranking better. Standard length used to be 500 words, or so, then it was 1000, and in 2016 it became 1500. In the next couple years, or so, it’ll go up to 2000 words, and that’s because as the duplicate content score goes up, we have to add more authoritative content in order to actually be unique. So, with that in mind, I think it would be VERY useful to have a tool that could help us quickly get the facts on a topic, organize them properly, and spin them. Why is it so offensive for a Machine to do what takes a Man much longer to achieve? I do SEO Consultations all the time, and a regular person, a business owner, would simply copy/paste the same generic data, describing their service, onto another page, dedicated to another city. Google doesn’t like that, and the regular person doesn’t know any better. There are many situations, in Local Biz & Ecom, where you can’t be a practical, down-to-earth person. You have to jump through hoops. So, not every situation is about spending a bunch of time creating a flowery CRO page. That’s cool, and I appreciate that, but the vast majority of sales situations don’t require it. Some of the highest converting stuff I’ve seen is just a simple video, or a headline, and then an opt-in space. Real people don’t waste their time reading through hoards of content. That’s why Vines exists, because people convert really well within less than 20 seconds of being exposed to any piece of content. No, large chunks of text are so that Google knows what your page is specializing in. You can sit around, like Backlinko, and right mega articles, and that’s great, they’ll get rewarded for that, but it’s a lot of research and infrastructural preparation. Not everything can be like that. Again, the vast majority of SEO, as a business, is a numbers game. A lot of typing work went into this comment. A lot of high quality content is in this comment. In the end, though…. it’s a comment. When I exceeded a hundred words, I hit a MASSIVE threshold for diminishing returns on this thing. Same idea when it comes to most of our articles. We need the facts, and that’s pretty much it. It’s really a research issue. It would’ve been better to talk about the actual functionality of the tool. Kontent Machine 3 has come withy more interesting features. It also offers 40% discount. Great news for the newcomers. Thanks for your article.